Are you ready to spend fifty minutes checking your wristwatch? Then have I got a Halloween special for you! In 1976, the endlessly prissy Paul Lynde was a recurring guest on ABC’s Donny & Marie, when he wasn’t the center square on – is this right? – 828 episodes of Hollywood Squares. 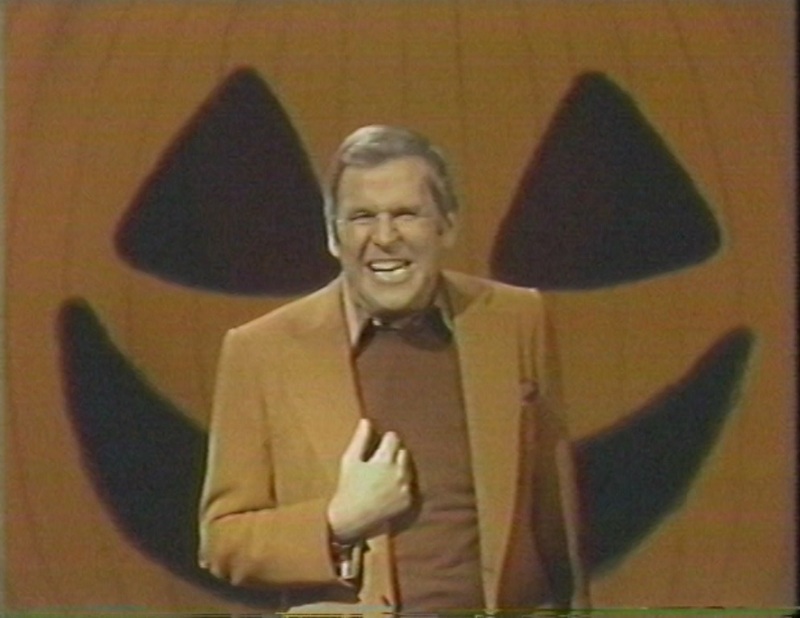 Apparently to give the Osmonds a week off, the production team taped a Halloween special with Lynde instead, with guest stars Florence Henderson, Tim Conway, and Roz Kelly, who had found an “I Didn’t Do It Kid” level of fleeting fame in the role of Pinky Tuscadero for three weeks on Happy Days and tried keeping it going here. With musical guests Kiss, who made their national TV debut that October night, they made the least funny and most 1970s thing ever. Jokes, such as they are, are built around Baretta and The Legend of Billy Jack, at least when Lynde isn’t sneering about Kiss’s makeup and elevator shoes, because hey, moms in Peoria and Des Moines, these rock and roll stars are weird people. Within weeks, the horrifying rumor that Gene and the boys never took off their makeup had cemented. I have no idea why that was meant to be so frightening, but my folks were really bothered by it. Yours as well, I imagine. So why in creation did we watch this thing? Well, it’s obvious, isn’t it? 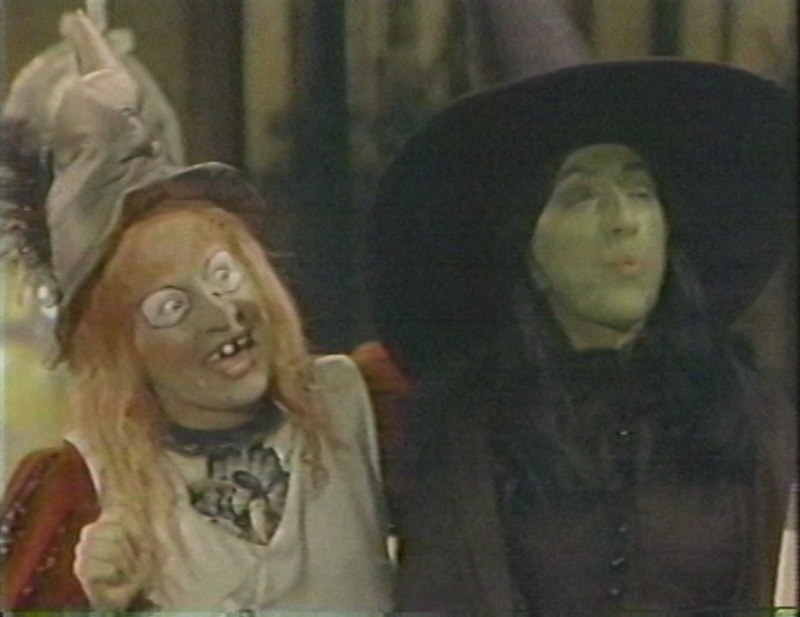 Billie Hayes plays Witchiepoo and Margaret Hamilton plays the Wicked Witch of the West. The writers gave them some of the worst dialogue you’ve ever heard. Good grief, who was responsible for this mess? Bruce Vilanch, you say? Oh, yeah, he’s credited at least in part for The Star Wars Holiday Special and all nine – all nine – Brady Bunch Hours. Good Lord. And the man writes for the Academy Awards these days. There’s a career arc. I enjoyed prepping our son for this more than revisiting it. I asked him last week whether Witchiepoo or the Wicked Witch was worse. He had settled on Elphaba (for that’s her name, damn your eyes) before I reminded him that Witchiepoo actually made him cry once. Earlier this evening, serendipity was on our side. We went by a Halloween Express to buy him a Hulk costume and there was a welcome mat that read “I’ll Get You, My Pretties.” I had fun with that. He giggled a bit through this, because this is television for six year-olds, and there’s great comedy for that age bracket when you’ve got Billy Barty biting Paul Lynde in the leg and a Peterbilt crashing through the wall of a diner. He really enjoyed the other two of Kiss’s songs, specifying that he likes “hard rocking music.” But the look on his face when Witchiepoo turned up was priceless. And honestly, I’d sit through just about anything to hear the lovely Witchiepoo cackle. Just about anything. I don’t believe she’s in any Pink Lady & Jeffs, but if this family’s ever not nice to me, I’ll make them watch those.